Journalism graduate Lewis Downes has won the inaugural Steve Becker Award for Radio. 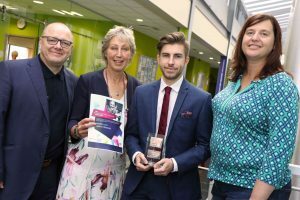 The award was set up by The University of Central Lancashire (UCLan) in honour of the much-loved Lancashire journalist who died in a traffic accident in March, having worked for the BBC for more than 30 years. Downes, 21, won for a news package about pub closures around the North West. The award was presented by Becker’s widow Kath and some of his former colleagues from BBC Radio Lancashire. Downes said: “It is a privilege and honour to win this award. Steve was an integral member of the Radio Lancashire team with a highly regarded reputation. Downes was awarded a three week-long placement at BBC Radio Lancashire followed by a week working for the BBC at Media City.